I’m thinking “stream of consciousness” but in this case, Airstream might fit too. Do you ever have times when you’re working on several different things that you can’t possibly image would overlap? Then you realize that they’re overlapping so much, they’ve managed to get tied into a neat little bow. Not these bows exactly but they’ll do. I’ve been writing about adjusting to new living quarters, chatting with Moda fabric designers, new fabric and some terrific notions and tools. 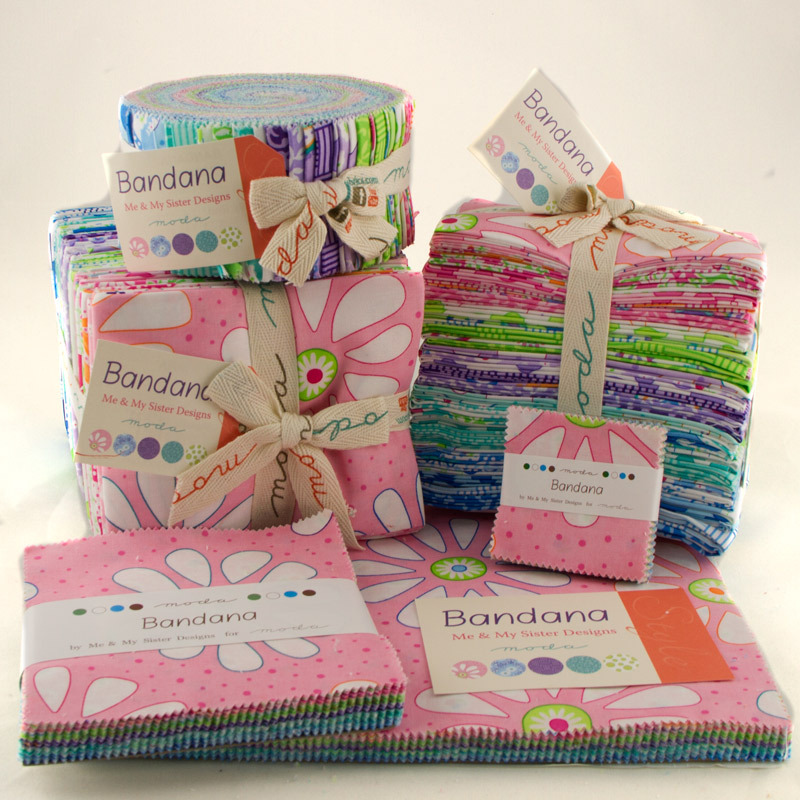 When I saw their just-shipped collection Bandana in the warehouse and pieces of their debuting-soon collection starting to arrive in the sample room, I took it as a sign that I really needed to chat with Me and My Sister – Barb and Mary – as Barb is also adjusting to new living quarters right now. One of the things I have most looked forward to here is getting to know the ladies – they’re almost all female – who are the “Moda Designers”. I know some of them pretty well and I know a few just a little bit… we’ve met and maybe spoken a few times. As a group, they’re smart, funny, talented and their personalities are as varied as their fabric collections. That makes perfect sense, right? They’re also “real people” and sometimes life gets a little crazy. I sometimes think it’s always crazy for Barb… but it’s especially true right now. As she says “she’s up to her eyeballs in ‘real life’ right now”. 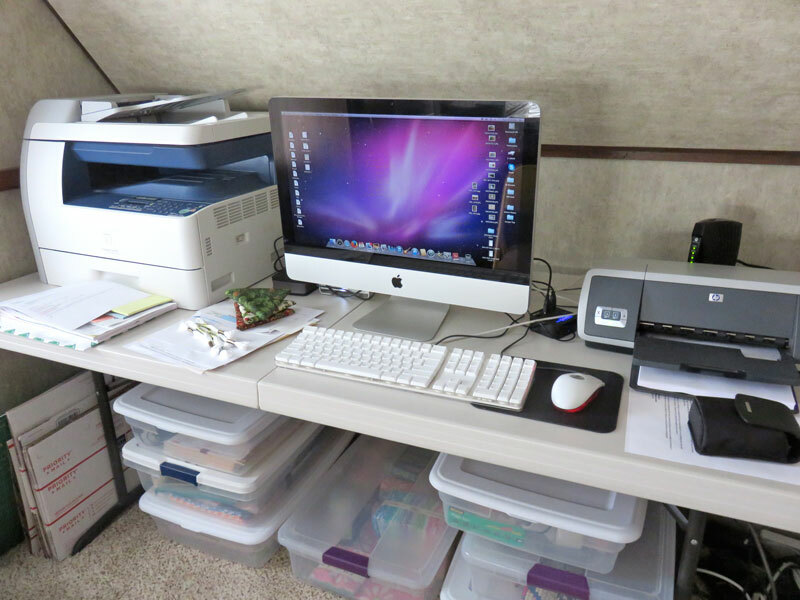 This is what you call a temporary office and sewing supply solution. After more than two months, everything is finally ready and the work to clear out the damage and begin getting the house livable again has commenced. 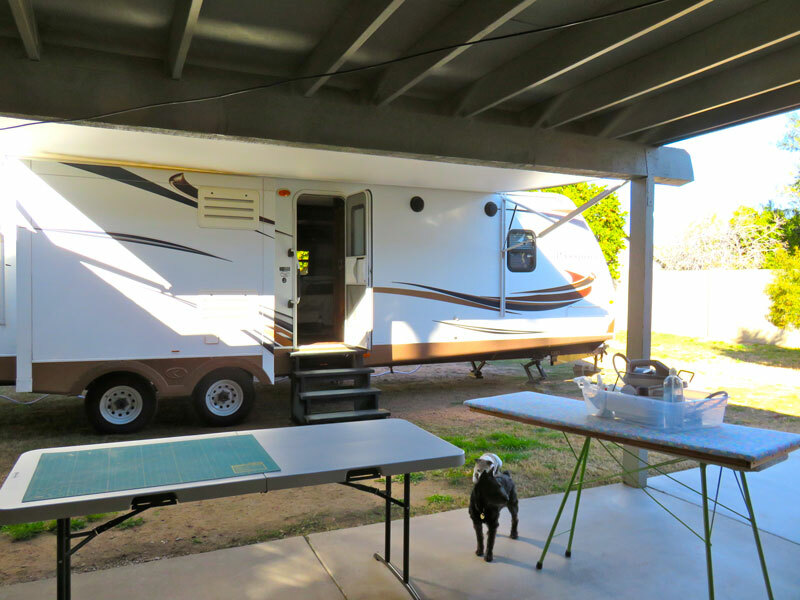 Rather than move to a hotel, Barb and her husband, Michael, decided to live on the property in an RV. It was easier to supervise the construction, and easier for Bella and Frasier. It’s not really an Airstream. Or an RV… Barb says she likes calling it that even though Michael keeps telling her that it’s a “travel trailer”. Yes, Barb is very happy to be living in Tempe and not New England. This is her outdoor-sewing area. And that’s Frasier in front, Bella right behind. What’s going on with the house? 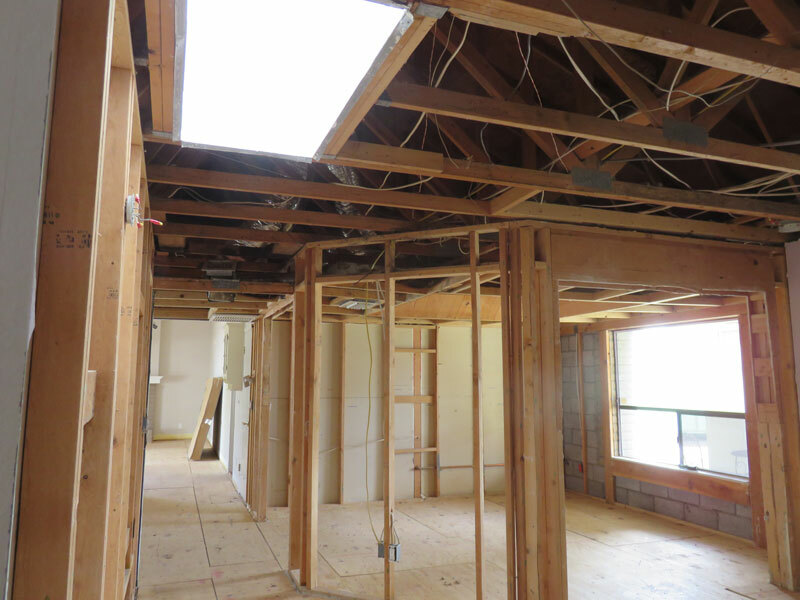 The demolition has finally begun and the walls and ceilings are being stripped to the bare bones. That will be next as most of the wood and almost all of the electrical wires will need to be replaced. New fabric is coming and that means Spring Market, and you’re working on some “special projects”… where are you sewing? Are you sewing? I have a makeshift sewing area outside on the patio for cutting and pressing, but I’m sewing inside the RV. Travel trailer. As much as we sew for work, we probably spend as much time on the computer… how are you adjusting there? This is my new office! It’s tucked under a bunk bed and while it’s a little cramped, everything fits because I created an ingenious system of sliding “drawers”. I just slide them over, get what I need and then slide them back. Hey Barb! I spy a bin full of Bandana pre-cuts! There’s more in the garage. I’m pretty well-organized, this is what I’m cutting this afternoon. Other than your trusty Sidewinder and sewing machine – I know you’re a die-hard Pfaff-girl – what tools do you have with you? 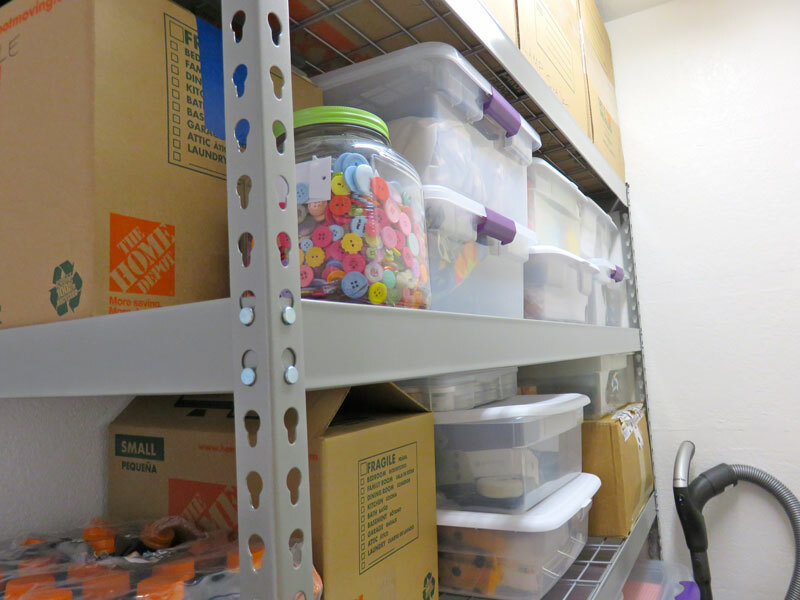 I have all of my basic sewing tools – rotary cutter, blades, rulers, etc. – in plastic bins. I also have my favorite bag with my binding supplies. Barb has had this beautiful embroidered zippered bag for years. Clover Needle Threader? Check. Lovely sharp scissors. Check. Thread Heaven? Check. Barb doesn’t stitch without it. The best thing about being one of these sisters is having some Me & My Sister fabric in the house. 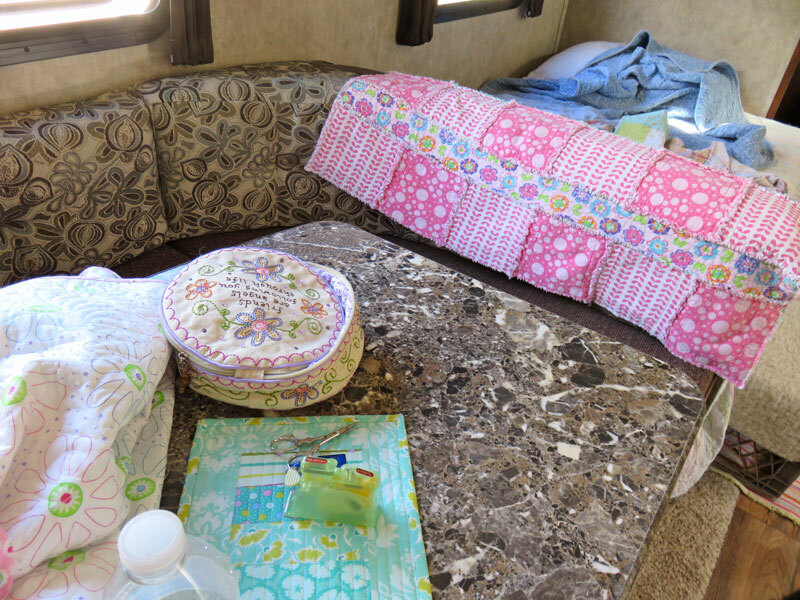 It’s colorful and happy… Barb describes the RV as being “so very BROWN”. So there you go… life, designer, new fabric, notions. Next time I’ll pester Mary. Yes, an office picture tomorrow. I do love all the cheerful colors of their fabric lines. I love reading your blog but have no idea why I don’t get them delivered to my email. I have signed up twice and still none. I have to go to your old blog and go to the new one through the back door. Any ideas? Thanks. This is a great interview. So neat to see what can be done with a small space in a creative way! Another great interview. Thank you. Quilters live the statement “where there’s a will there’s a way”. Love their new fabric line. i love this new blog. It is so informative. 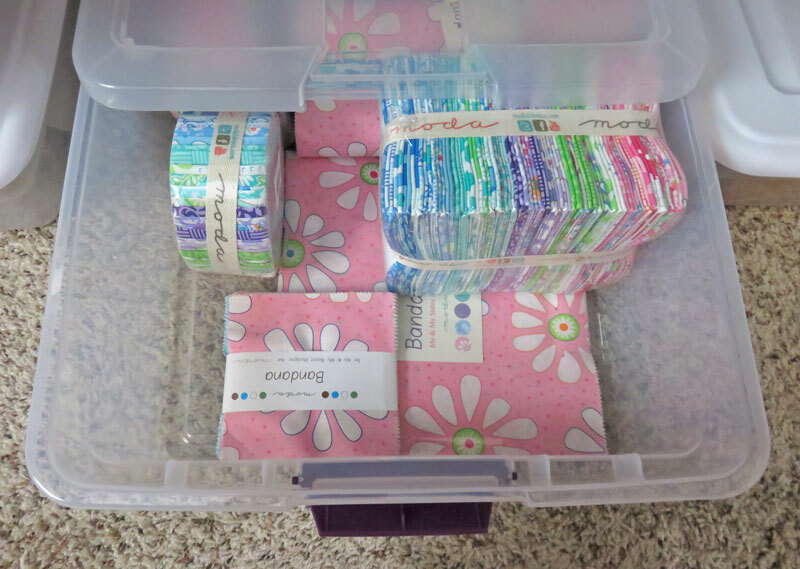 I’m glad to see that I’m not the only one who uses those nice clear bins to store fabric! Love the new line! The fabrics are lovely, bright and cheerful, home is where the heart is, and you have made this best of this rough patch. Keep on stitching. So happy you are blogging all the time. You are a great story teller. Oh my! I won’t complain about the few little main fence issues in our house this year! somehow I get the idea that Barb and Company are experts at taking a deep,breathe and keeping on, keeping on! Hmmm…that would be maintenance issues in our house…lol! Love the new collection, and your good spirit. Crikey, Barb and her family have had quite a time! Not sure I could share a small brown space for more than a night or two so Barb has my full admiration!